Washington created and supports virtually all well-known terrorist groups and offshoots operating in Syria and elsewhere – used as imperial foot soldiers. They couldn’t exist without foreign backing, supplying arms, financing, training and other material support. Hours into Syria’s cessation of hostilities, a car bomb exploded in Salamiya in Hama province, south of Aleppo. It killed at least four, injured others, and showed the fragility of ceasefire straightaway after its implementation, indicating the illusion of achieving a durable cessation of hostilities and peace – impossible as long as Washington and its rogue allies want war. Heavy fighting continues. No letup is envisioned. Government forces continue battering ISIS and other terrorist groups, greatly aided by Russian air power – both countries committed to keep combating a universal scourge vital to eliminate. Obama insists Syria’s future “cannot include Bashar al-Assad.” Fighting won’t stop until he’s “out of power,” indicating US regime change plans remain firm. It continues supporting ISIS and other terrorist groups. Hostility towards Russia remains intense. Two US ICBM test launches in the past week signal Washington’s preemptive use of nuclear weapons remains an option, on the phony pretext of defending national security. Lunatics infesting Obama’s administration and Congress consider Russia America’s top strategic threat. So does NATO commander General Philip Breedlove, calling Moscow an “existential threat” to the West, a reckless, saber-rattling statement. America “will defend our interests” against a nonexistent Russian threat, he blustered. He, Obama, Breedlove and other hawkish US officials show desperation in claiming Russia’s effective war on terrorism in Syria made things worse, not better. It changed things dramatically on the ground for the better, shifted momentum, achieved remarkable results in a short time. 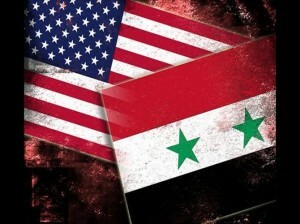 It’s preserving Syrian sovereign independence, at the same time foiling Washington’s regional imperial agenda – US policymakers frantic to find a way to counter its successes strategically. Russia is a force to be reckoned with. Its commitment to defeat the scourge of terrorism is the only chance for regional peace and stability. In a show of good faith, its military halted airstrikes against armed groups in areas agreeing to cessation of hostilities. Expect resumption if violations occur. Given America’s wage for war and regime change, it’s just a matter of time.